Woman of the Year (1942) is one of the 1001 classic movies you should see. 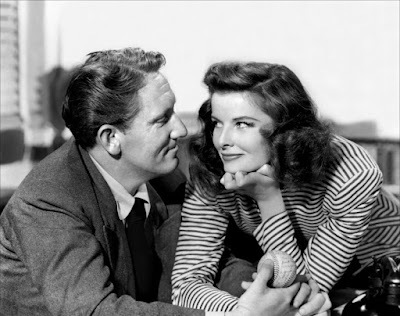 This romantic comedy stars Spencer Tracy and Katharine Hepburn as dueling newspaper reporters who fall in love. Each Monday Friday, I'm going to recommend a classic movie you should see (for the reasons behind the 1001 series and reviews of earlier films covered go here). This month I'm writing about the leading ladies of 1942. This week's movie is the romantic comedy Woman of the Year, which earned an Academy Award nomination for star Katharine Hepburn. Woman of the Year tells the story of Sam Craig (Spencer Tracy) and Tess Harding (Katharine Hepburn), dueling newspaper columnists at the New York Chronicle who get into a public spat about the importance of baseball during wartime. After their publisher demands a truce, the pair make peace at a baseball game and soon find themselves madly in love. However, their marriage runs into problems when the worldly Tess and down-to-earth Sam clash over everything from her career to the proper way to fix breakfast. 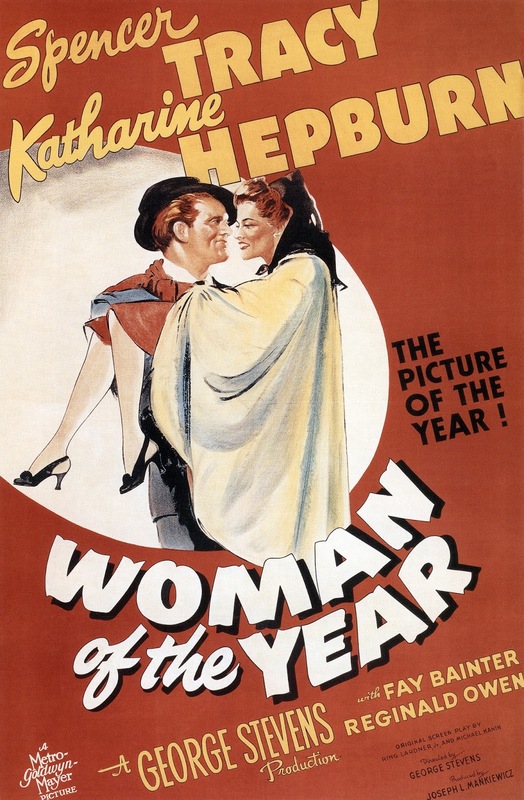 Woman of the Year was based on an original screenplay by Michael Kanin and Ring Lardner, Jr., that was specifically tailored to fit Hepburn's independent woman persona. The actress sold the screenplay to MGM for $250,000, and she had a great deal of clout during the production, choosing both her leading man -- she and Tracy had never met before they began working on Woman of the Year -- and director George Stevens (a veteran of comedies and musicals, he had worked with Hepburn in Alice Adams and Quality Street). The result was a huge hit that earned Hepburn and the screenwriters Oscar nominations, and established Tracy and Hepburn as one of old Hollywood's top romantic teams. After bursting onto the scene with her star-making role in A Bill of Divorcement (1932), Hepburn had a series of ups and downs in Hollywood. She was labelled box-office poison in the late 1930s, but, after two years absence from the silver screen, she made a triumphant return in The Philadelphia Story (1940). Woman of the Year firmly established Hepburn as a top MGM star, and helped imprint Hepburn's persona as a strong, independent woman in the public's mind. It also forever linked Hepburn with her co-star and off-screen love Tracy. They would go on to appear in eight more films together, including the classic rom-coms Adam's Rib (1949), Pat and Mike (1952), and Desk Set (1957). 1. The comedy of remarriage. This genre flourished in the early 1940s: the aforementioned The Philadelphia Story is the best known movie in the genre, but there's also Mr. and Mrs. Smith (1941), The Palm Beach Story (1942), and His Girl Friday (1940). Of all these films, Woman of the Year is the one that most accurately deals with the trials and tribulations of real marriage, specifically how both partners have to give in a little bit to make a relationship work. 2. Visual comedy. Stevens, who would go on to make films like A Place in the Sun (1951), Shane (1953), and Giant (1956), honed his craft making comedies with Laurel and Hardy. His great sense of comic timing is evident throughout Woman of the Year, especially in the famous scene where Tess tries and fails to cook breakfast. 3.Baseball. Woman of the Year is something of a stealth baseball movie. Sam frequently celebrates the glories of America's pastime in speech and print, and the scene at Yankee Stadium where the overdressed Tess asks a serious of "who's on first" style questions is the funniest in the movie (my favorite line is "are all these people unemployed?" when she looks around at the large crowd). 4. William Bendix. The future The Life of Riley star has a great role as Sam's barkeep buddy who has a memorable boxing story that literally goes 12 rounds. 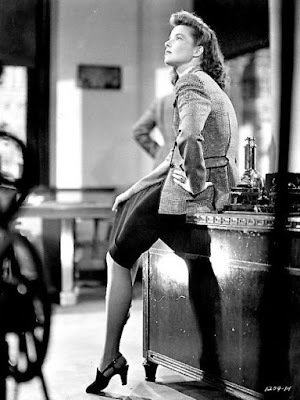 Katharine Hepburn on the set of Woman of the Year (1942). Other critics: Woman of the Year has a 92 percent fresh rating at Rotten Tomatoes and Leonard Maltin call the film "a joy" in a 3.5-star review in his Classic Movie Guide. Critics in 1942 mostly praised the movie, although some dinged it for being overly corny. Time critic James Agee wrote that "for once, strident Katharine Hepburn is properly subdued" adding that she and Tracy turn "several batches of cinematic corn into passable moonshine." However, Bosley Crowther of The New York Times had no such reservations. His love for Woman of the Year compelled him into "weaving a joyous snake dance over the typewriter keys." He then outdid himself with superlatives, writing, "here is the jolliest screen comedy that's come along since 'The Lady Eve' — a cheering, delightful combination of tongue-tip wit and smooth romance, a picture of surface brilliance designed unreservedly 'pour le sport' but with enough of a homely little moral to make it quite comforting in these times. It's as warming as a Manhattan cocktail and as juicy as a porterhouse steak." The bottom line: Woman of the Year distills Tracy and Hepburn's particular brand of screen magic better than any of their other screen pairings. Watch it for their unbeatable chemistry, Bendix bringing the funny, and, of course, baseball. Availability: Woman of the Year will air at 8 p.m. July 15 on TCM. Also available on DVD, Blu-ray. and video on demand. Next Friday I'll continue the theme of the leading ladies of 1942 with Agnes Moorehead, Dolores Costello, and Anne Baxter in director Orson Welles period drama, The Magnificent Ambersons. The script of Woman of the Year is both entertaining and thought-provoking, but I can't imagine it working as well without that dynamite first teaming of Tracy and Hepburn. I read somewhere that MGM tried to force Kate to go with Walter Pidgeon for Tracy's role. It would have been such a different movie without their special chemistry.